One autumn day in 2007, Catholic Charities adoption social worker Rosalind Carito opened her mail to find a photo of Alex, beaming in his Red Sox shirt. Along with Alex’s photo was a celebratory announce-ment that his adoption by Matt and Dana Gauvin had become a joyful reality. Alex finally found his forever family. 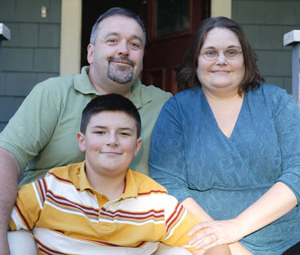 Back in 2005 the Fitchburg couple came to Catholic Charities with their hope of becomg adoptive parents for a school-age child. Over the next several months Rosalind provided guidance and formal training for them and other prospective adoptive families. The Gauvins learned how to anticipate and cope effectively with the challenges of parenting a child who experienced many earlier disappointments and losses. Determined to go forward, they were supported by their own extended families and Father Robert Bruso, pastor of St. Anthony of Padua parish where Matt works as an 8th grade teacher. The next step for Matt and Dana, after Rosalind conducted a formal homestudy, was to determine with Rosalind what child might come into their lives. Recently celebrating her own 40th anniversary as a Catholic Charities social worker and no stranger to the adoption process, Rosalind has spent many of those years helping match youngsters yearning for a stable, nurturing home with their forever families. Rosalind worked with the Department of Social Services to identify a child whose needs and strengths could be complemented by Dana and Matt’s wisdom, maturity and commitment. Their introduction to Alex led to day visits, followed by weekends together. Getting to know one another took time and patience. Knowing that the adoption of an older child is a two way street, Rosalind worked in partnership with Alex’s DSS social worker paying attention to the chemistry of Matt, Dana and Alex’s new developing parent/son relationship, supporting and encouraging, listening to hopes and doubts and being attentive to losses still mourned. Now each morning 12 year old Alex says good-bye to his mom as he and his dad head out the door together for St. Anthony of Padua school where son and father become student and teacher. But only until dismissal. Now that adoption has restored his hope, Alex and his dad, at the end of the day will head back home — TOGETHER.